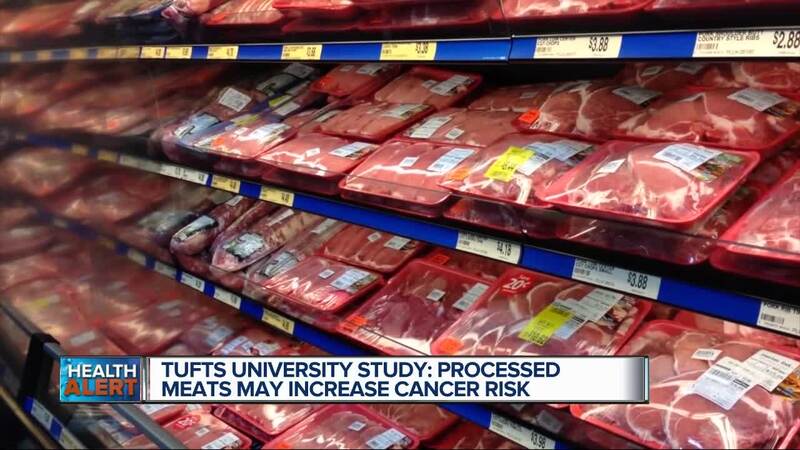 Ask Dr. Nandi: What’s the link between cancer and processed meat? If you are a bacon or hot dog lover, well, we’ve got some bad news for you. After hundreds of studies were analyzed, Tufts University reports that eating processed meats may increase your risk of cancer. (WXYZ) — If you are a bacon or hot dog lover, well, we’ve got some bad news for you. After hundreds of studies were analyzed, Tufts University reports that eating processed meats may increase your risk of cancer. Question: What’s the link between cancer and processed meat? Back in 2015, the World Health Organization classified processed meat as a carcinogen. And carcinogen means that a substance is capable of causing cancer. Now current research shows convincing evidence that eating processed meats often can increase the risk of colorectal cancer. And the findings of another study discovered postmenopausal women who ate on average 9 grams or more of processed meat a day, faced a 21 percent higher risk of breast cancer. And to give you an idea of how small 9 grams is. A typical serving size for packaged lunch meat is roughly 56grams. Question: Why is processed meat so bad for you? When you buy processed meats like bacon, ham, sausage, and deli meats, it means the meat has undergone a process to preserve or flavor it. So it’s been salted, smoked, cured, fermented or had nitrates added to it. Now deli meats are notoriously known for high sodium levels. And six thin slices can contain roughly half the amount of daily sodium adults need. And too much sodium raises your risk of high blood pressure and heart disease. Now when it comes to cancer and processed meat, nitrates used to prevent bacterial growth. But when processed or cooked, nitrites can form into nitrosamines. And these are classified as carcinogens. Question: What if you love processed meat, how much is too much? 1. Only eat processed meats occasionally. I’d prefer you eliminate them altogether because even small amounts raise your risk of colorectal cancer. 2. Check the sodium content on all packaging labels. Try to stick to 2,300 milligrams a day. 3. Avoid grilling or pan-frying. Cooking meat at high temperatures leads to more carcinogenic chemicals. 4. Skip the “no added nitrates” options. Often celery juice or other natural sources of nitrates are used instead. And unfortunately, there is no science out there that shows these are safer options. It’s still possible they can form carcinogenic compounds.